If you know the dealer the car is coming from, why not just call that dealer directly and deal with him, bypassing your dealer, the middleman! Think it would save you time, aggravation and money! You folks must have some strange dealers in the North. Last year, 2017, I ordered the E300 in my sig, a BMW 540i and a Hyundai Elantra GT from 3 separate dealers. I was never asked to give a deposit. I received weekly order status updates from the sales agent without asking. Poster 2012 merc amg is listed as Venice, Florida not the North. Seems like no matter how you do it with Mercedes whether it be an order or a in stock car it’s a nightmare dealing with them. I was buying a wagon that was in stock that the dealer I’m using was getting from another dealer. 3 days has gone by now and they are not returning calls as far as wether they are even able to get the car I wanted from the other dealer. I’m beyond the point of really caring at this point. I’ll fight them to get back my 500 dollar deposit and I’m thinking at this point anything to do with dealing with a Mercedes dealer is just dealing with arrogance. I stopped at a Audi dealer yesterday and night and day difference. They build a nice car too. For starters the sound systems are much better. These Burmeisters are horrible sounding. Even the old HK units were much better. I’m really thinking about an Audi allroad prestige at this point. Don't work with a dealer who doesn't work with you. Go to the dealer who has the car you want instead. I don't agree at all with your assessment of the Burmester system though. It's a truly fantastic system and far better than the HK Logic 7 system of earlier generations. Either way, it's your money. If you think you'd be happier in and Audi, buy one. That's why there are choices out there. Ps: I can hook you up with my dealer here in Tampa, who is beyond fantastic. Send me a PM if you'd like a great contact and I'll ensure he takes great care of you. Last edited by rbrylaw; 10-25-2018 at 06:53 PM. Surprised to hear the comments about the Burmester. I had it in the 2018 E400 and the sound was excellent. Maybe your unit needed a bit diagnostic or software tweak. I also had the Harmon Kardon in prior MB's and they were nice units as well. With regards to the MB dealership experience, I can tell you that in my 14+ years in dealing with various dealerships (New Jersey and Florida), their sales and service experience have been great. Not to say that I have had some disagreements on some issues, but at the end of the day, they came through for us. Yes. You guys are right. The dealer here in Sarasota does not deserve my businesss. The sales manager said they may call me tomorrow. But who knows. I actually am a retired dealership owner and have never seen anything like this before. I told the sales manager give the other dealer a call and see if you can get the car I have a 500 dollar deposit on and then call me back. He said that is not following protocol. Lol. It’s a big joke. But ya if I don’t hear back from them tomorrow morning I’ll see if I can drive my s550 up to the dealer that actually has the car and just work the deal with them. I need too take a trip up to Tuscaloosa next weds anyhow and the dealer is not far from there so I could give them my S550 and drive off in the E450. I’ll never attempt this thing of a dealer locating me a car not worth the aggravation. I should have known better. The Sarasota dealer has a storied reputation of not being customer focused. If I were you, I'd be on the phone right now with the dealer who does have the car. Unless my car refused to get off the ship, it is now on land. The ship has left the Brunswick port and is now headed to Charleston, SC. Odd as it went right by there on the way to Brunswick. Maybe picking up cargo to take back to Europe? you could be right. It’s the logic 7 in my 2018 E63 amg. I got in my 2015 S550 the other day and the HK in that car sounds so much better than the AMG. The Amg stereo has a very electronic and non musical cold sound to it. No depth and no stage. The system in my S550 is just the premium package base and not even the 3d. In the wagons they do not even offer a upgrade system anymore. In the 212s they use to offer the bang and Olufsen upgrade if they still did I’d spring for the extra money and get that. I’ve been thinking of just keeping the S550 and driving it up to 100k miles and just say screw the new wagon. Not worth it. Mine must also be on land, hopefully at the VPC SPA as well. 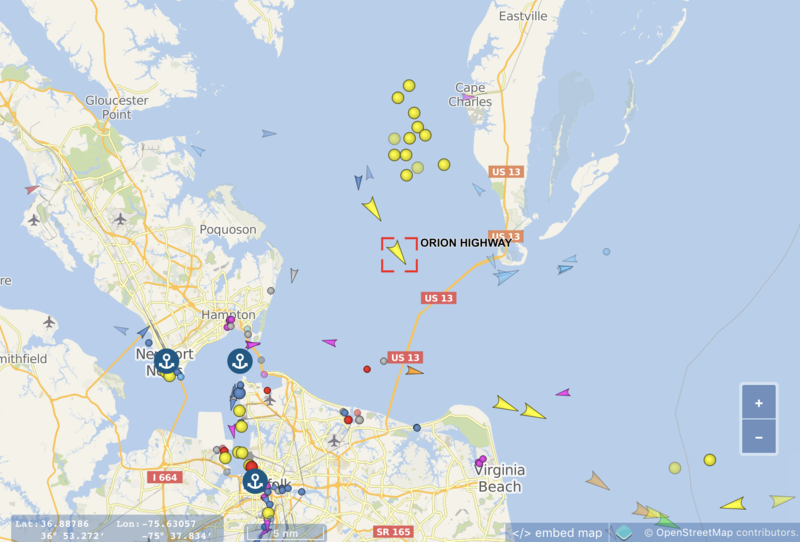 The ORION HIGHWAY is now on its way towards you, Port of BRUNSWICK. Probably to drop off additional cars? Will be interesting to see who gets their car first. I hope we both get to post pics at the same time! Yes I do!! It's not an E Class, I'm replacing my 16 GLC with a beautifully optioned up 19 C300 4Matic sedan, which I ordered in early July...and got word today that production is done and the dealer expects to get it this weekend, and delivery Monday afternoon Oct 29!!!! I assume that the W205s built in Vance go through VPC (and I'd assume Brunswick since they handle North Carolina) before going out to the dealers, so if so that is like an express VPC Spa stop before going on the move again up here! Maybe, just maybe, he will say "hi" to your cars. This thread is still super entertaining to follow! And I cannot wait to see the pictures of your builds....the E Coupes look super nice! I hope you enjoy your new C300 and knowing it's coming and you're getting it Monday is great! For me and rustybear3, not knowing is what's hard. It's like knowing Christmas is soon, but not knowing exactly when. our CLS is ready to ship to our dealership as of this morning. just got informed: ETA to dealership: 10/31!!!! Talk about timing and hopefully earn the Loyalty Program credit. I'm jealous! I have no new information and am doubtful my car will show up in time to take advantage of the Loyalty discount. I'm super happy yours is though!! fortunate that I have known the sales manager for over 13 years and he is superb. I've known mine at least that long, but the status on my car hasn't changed, so there's nothing they can do to move it through P1 faster than P1 goes. I'm replacing my 16 GLC with a beautifully optioned up 19 C300 4Matic sedan, which I ordered in early July...and got word today that production is done and the dealer expects to get it this weekend, and delivery Monday afternoon Oct 29!!!! Congratulations you two! Look forward to seeing your pics! Rbrylaw and I are jealous that you know your dates; it is like Christmas in October! Woo Hoo! My car is now D5 - Released to Carrier!! Still doesn't show an ETA to the dealer, but we're not that far from the Brunswick, VPC, so my dealer assures me the car will arrive before the 31st. Wow, congrats, good deal. My dealer just secured my new white E450 Wagon and I should have it next week. That brown ash wood has some interesting looking patterns to it especially on the center console, not sure if I like it or not, I think I like the burl wood better but this car has about the right equipment so it's a small thing, whenever you take a in stock car you need to make some concessions. Last edited by 2012 merc amg; 10-26-2018 at 10:25 PM. I'm glad you're getting the car you wanted. I think you'll be pleasantly surprised with the Brown Ash wood. I specifically wanted the Natural Brown Ash wood on my build. I also think you are going to like the brown ash. The open pore aspect feels nice to the touch and it always draws attention when new people get in the car (black ash in my case, have seen the brown as well). I've had natural black ash in my C300 and both the E300 and E400 have it as well. I love the open pore look and feel. I'm looking forward to having the brown ash in my E450. It will compliment the Nut Brown Leader nicely!